ADSS supplies a wide variety of roll laminators, and roll laminating machines from some of the best brands on the market. A roll laminator will help protect and preserve documents between two sheets of laminate film; a 27" roll laminator will require laminating film up to 27". Our selection of laminators varies from commercial grade to general use, with heat sources varying from cold roll to heated rollers or heat plate. Commercial quality laminating machines are available in wide format and offer many features that bring convenience and quality to the work place. 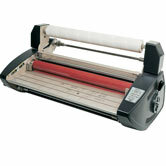 General use laminators include those used in schools. Teachers can easily preserve the work of their students and their own teaching documents with easy to use desk top laminators. ADSS offers a wide variety of roll laminators, and has prepared a useful comparison table to help compare the various features of the machines. 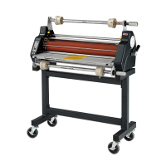 Browse our selection of other Laminating Machines, including Pouch Laminating Machines, Wide Format Laminating Machines and Laminate Accessories as well as our large selection of Paper Cutters, Coil Binding, GBC Binding and Tape Binding Machines. Consult with our knowledgeable staff if there is a particular machine or product you require. We guarantee you won't be disappointed. The TCC-1400i is a 14" professional grade roll laminator for volume laminating of documents less than 14" wide. 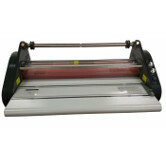 This heated roller laminator is capable of laminating up to 10mil in thickness and mounting up to 3/16" board. The Phoenix 27” Education Model is perfect for use in Schools and Offices. Its tabletop design is great for small working areas. This machine will efficiently laminate any size document up to 27” in width. 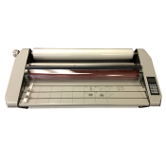 This economical single-speed roll laminator is reliable and easy to use, making it ideal for schools. It laminates up to 3 mil film and mounts any material up to ¼" thick. The 12" PL-1200HP is a cost effective yet high performance laminating machine. It not only produces a superb finish and edge seal, but it is also capable of speeds up to 17 feet per minute on 1.5 Mil material and up to 10 feet per minute on 3 Mil. It accepts films from 1 to 10 Mil thick and will laminate materials such as foam board up to 1/4" thick. The PL-1200HP sets up in minutes and has a thru-put capability in excess of 1000 feet per hour. 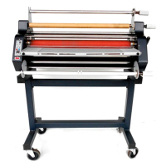 The Minikote 27" Roll Laminating Machine laminates film up to 3mil thick at 9.5 feet per minute. 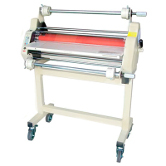 27" heated roller laminator for films up to 10 mil thick. Great for tough to laminate documents. 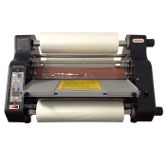 The TCC 2700XM 27" heated roller laminator can laminate and mount your documents in a single pass. It can laminate up to 10 mil film, single or double sided. The four heated rollers apply even heat to safely laminate all documents, including photos and digital prints. The TCC 2700XM features all metal construction and digital electronic controls for long life and ease of use. tabletop design is great for smaller working areas. The Versalam 1300 is a heavy duty 13" wide laminator capable of both double and single sided lamination and mounting up to 1/4 inch. It uses heated rollers for high quality laminating, even with difficult materials. The Versalam-2700 P does it all: single or double sided laminating, with all film up to 10 mil, and mounting too. It's a great soultion for all of your laminating needs up to 27" wide. The Versalam-2700 EP does everything the 2700 P does and does it faster. It does single or double sided laminating, with all film up to 10 mil, and mounting too. 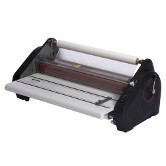 It is designed for production laminating of all materials up to 27" wide. The Versalam-2700 HC is a heavy-duty metal construction laminator suitable for any use from schools to commercial printi shops. It does one or two sided lamination, cold lamination, and mounting. The Versalam-2700 HC uses heated silicone rollers for crystal-clear laminating on all materials. 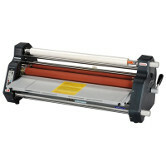 The Professor 27" Hot Roll Laminator can laminate up to 27" documents. 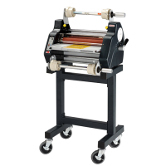 It can run laminate roll film from 1.5 mil to 10 mil thick and mout material up to 3/16" thick. 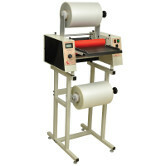 The heated roll design permits simultaneous mounting and laminating using mounting boards with attached over laminate. 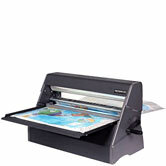 The GBC Catena 65 Hot & Cold 25" Roll Laminator laminates, mounts and encapsulates you color prints. It uses roll laminating film 1.5"mil to 10mil thick and up to 25 inches wide. 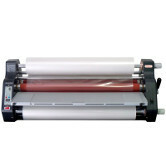 The Roll laminators silicon rollers ensure a smooth scratch free lamination of all your prints. 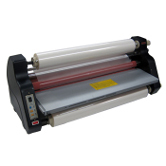 The Tamerica TCC-655Q 25" roll laminator can easily laminate everything from small documents to large posters. This two sided laminator is appropriate for schools, businesses, and copy and print shops. applies cold laminate film, adhesive, or both. The Xyron 1255 Pro offers three solutions in one easy-to-use package, the Xyron Pro 1255 makes applying adhesive to mock ups, storyboards, or comps up to 11.75” wide fast and easy. 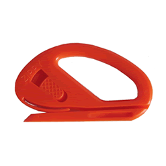 Instantly applies laminate, adhesive or both without heat or electricity. This easy to use machine applies cold laminate film, adhesive, or both.